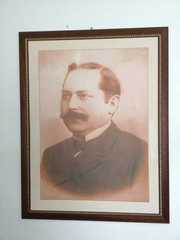 Prospero Guidone was a physician, surgeon, journalist, parlamentarian. He distinguished himself in the unexplored field of cardiology, performing the first sature of the human heart. Author of numerous essays, he contributed to innovate the surgical technique by inventing tools necessary for his work, such as the "Pinza Guidone" for operations on parenchymal organs.